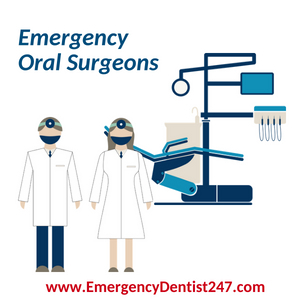 Emergency 24 Hour Dentist Near You | 24/7 Emergency Dental Care Now! Chipped my tooth playing basketball and got an emergency appointment right away. Probably the best dentist I've been to in Houston or anywhere else for that matter. Can I give 6 stars? Woke up at 2am in Manhattan with excruciating tooth pain and found their number. Thanks for taking care of my dental emergency later that same day guys! Welcome to Emergency Dentist 24/7, where you receive help from an emergency dentist within a time frame of as little as 24 hours. Whether a tooth has come out, you’re experiencing unbearable oral pain, or you feel that you’re suffering from an oral health problem that feels as if it’s an emergency, we are the best resource to turn to for immediate help. 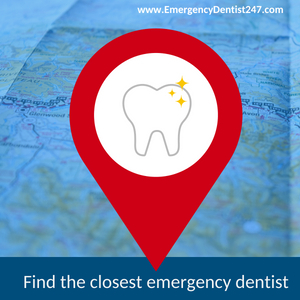 Locating an emergency dentist near you isn’t always an easy thing to do, especially if it’s a last-minute emergency that requires help immediately. You may need an emergency dentist for a wide variety of different reasons, but one thing is certainly for sure, you’re in the right place if this is the type of help you’re currently seeking. Because emergency dentistry is no laughing matter, we’ve helped patients across the nation find the closest emergency dentist in their local or general surrounding area. 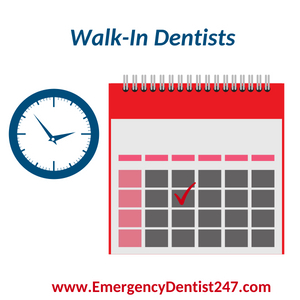 Whether you’re looking to find an emergency dentist that offers regular dentistry services on the side, a walk-in dentist with immediate availability, or just some last minute dental care for an emergency oral health procedure to be taken care of as quickly as possible, we can have an appointment booked and ready to go in your name in as little as 24 hours. If you’re stuck in a dental emergency and are asking yourself, “where can I find an emergency dentist near me?”, we can help you. Unfortunately, there are a lot of common dental emergency problems that are seen every day. Whether or not you may be going through one of the problems listed below, it’s important to know what they are and how serious they can be. Before we get into the most common dental emergencies, it’s important to remember that if your mouth is continuously filling up with blood or you have any trouble breathing whatsoever, you must call 911 or immediately visit your closest emergency room for help. Please keep in mind that a lost permanent tooth can be a time-sensitive dental emergency, so don’t delay in calling us for help! If you’ve had a tooth become displaced as a result your wisdom teeth breaking through or because of an injury, do not try to move it on your own. Tooth displacement is when an injury or other form of oral trauma has caused a tooth to move out of place. Like the previous common emergency, tooth displacement is a time-sensitive issue. It will mess with your jaw, your bite, and can cause some extreme discomfort if the displacement is severe enough. It can even cause your tooth to shatter or pop out completely. The sensitivity of time with this issue is because, if you wait too long, the dentist may not be able to successfully move your tooth back into its original placement and it will have to remain that way. While a chipped tooth may not seem like a dental emergency, it can turn into one extremely fast. You yourself are not able to assess the chip, which may cause the entire tooth to fully crack, break, or even, if worst comes to worst, shatters completely. As we mentioned earlier, a chipped tooth can quickly turn into a broken one if you’re not careful. Oral infections, such as abscesses, for example, are no laughing matter. Not only are they a time-sensitive dental emergency, but they are also one that can be threatening to your life if they are not taken care of as soon as possible. You will generally be able to tell if you have an oral infection because of the pain. It starts out small but will completely take over your mouth if left untreated. You will also notice the swelling and the redness of your gums, as well. Most oral infections can be treated safely if caught early and some will lead to needing to have a tooth extraction or root canal. If you have an oral infection that is at a critical level, meaning you are having trouble breathing, swallowing, or your throat has major swelling, forget about calling an emergency dentist and call 911 immediately. However, if the bleeding is persistent, extensive, or just won’t stop, seek immediate care with your local emergency room or local emergency dentist, whether you call us to set you up with an appointment or not. If you’ve had a crown come out or have broken braces, call us immediately. These types of dental emergencies cannot be taken care of at your local emergency room and require an emergency dentist. If you are unsure about what to do when it comes to your damaged dental work, call us and we will put you through to a dentist for some advice until you can get to your appointment. Nothing could be more alarming than experiencing a dental emergency, especially with it’s Saturday evening. Do you think your emergency can wait until Monday morning? Probably not, which is why reaching and seeing an emergency weekend dentist, especially one that offers hours during the evening, is so important. If you’re in the midst of any form of dental emergencies, you’re no doubt trying to track down a 24-hour dentistry office in your immediate or surrounding location. Even though are 24-hour dentistry offices open across the nation, we think you’ll agree when we say they are incredibly difficult to find. If you’ve ever found yourself trying to Google “24 hour dentist near me”, we feel your pain. A lot of patients have come forward after trying to track one down to ask for our help in locating one as soon as possible, so we understand the struggle that comes with trying to find one of these magical offices during the late or early morning hours. 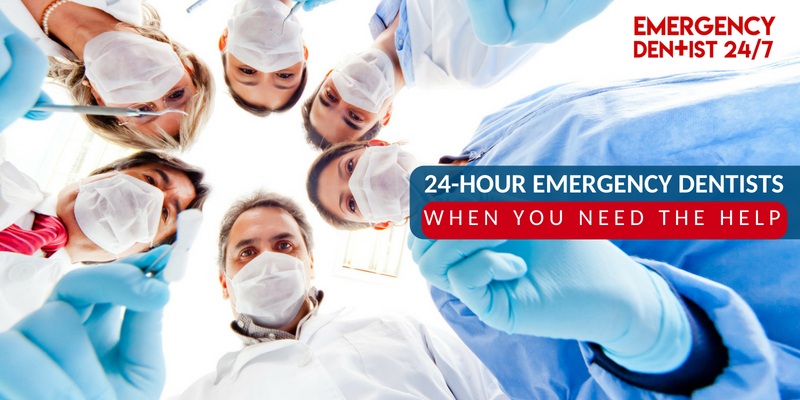 Because 24-hour emergency dentistry offices are so hard to track down, we’ve created a vast network of 24-hour emergency dentists who have, as the term suggests, offices that are open 24 hours a day. We’ve also found that, though their website would suggest they operate on a 24-hour basis, some dentistry offices actually don’t offer 24-hour service. Unfortunately, this is incredibly frustrating for patients who need immediate help to deal with, especially if they’ve already made the trip down to the office to find a locked door and no help in sight. Therefore, we suggest that, instead of calling their dentistry office and wasting your time, you call us. We already know right off the bat who is open and who is not, which saves you both time and frustration. Not only do we have a directory of real 24-hour emergency dentists, we also have a number of local hospitals who offer emergency dental services near you. Keep in mind, however, that not all local emergency rooms offer emergency dental services, which is why we only have the select few that do. Because there are so few true 24-hour emergency dentist clinics and offices in the nation, taking the search to Google yourself will seem like an impossible task. Thankfully, considering you’ve landed on our website, you’re one phone call away from getting access to one without even trying! If you’ve never heard of them before, you read that headline correctly, there are walk-in dentists in the United States! These types of dentistry offices offer dental services without having to book an appointment in advance. Whether you’re worried about your suddenly receding gum line or lost a filling, you might be looking for a walk-in dentist. Unfortunately, they can be difficult to locate. While they aren’t exactly a rarity, they can be tricky to locate in a pinch. This is because they generally do not advertise that they offer walk-in services, whether they offer both services through walk-ins or by appointment. You generally won’t find many emergency dentists who offer walk-in services, though. Because of this, we’ve scoured the nation to find not only emergency dentists, but any urgent care dentists who offer even a scrap of walk-in emergency services. Fortunately for you, our operators have all the connections you’ll need in regard to walk-in emergency dentists in your local area so you don’t have to look for one! 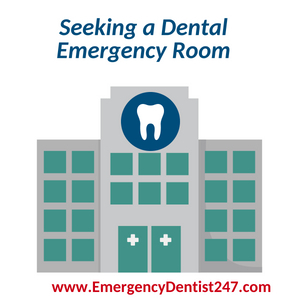 Above all else, if you’re seeking a dental emergency room, then you know how serious your dental emergency really is. If this is the case, you’re definitely in the right place and going in the right direction for help. Because the majority of typical hospital emergency rooms aren’t going to have what you need depending on your oral emergency, you’re going to need a legitimate dental emergency room, instead. Fortunately for you, there are dentists out there who work with local hospitals and are brought in when there is an emergency. At the same time, however, these instances can be rare, hence the need for dental emergency rooms. If you’re looking for a dental emergency room, give us a call. We can point you in the right direction immediately to ensure that you waste no time in receiving the help you need. If emergency oral surgeons are new to you, let us assure you, they are very necessary in certain instances. For example, sometimes an oral infection, such as an abscess, cannot be reached unless an oral surgeon can go directly underneath the gum line and around the root area of a tooth. Aside from critical oral infections, you might require an emergency oral surgeon for severe trauma to your soft tissue, an emergency root canal, or even replacing a filling that has come out. If you’re currently trying to track down an emergency oral surgeon for whatever reason, give us a call. We have a number of them included our emergency dentist network that reaches the far corners of the nation! 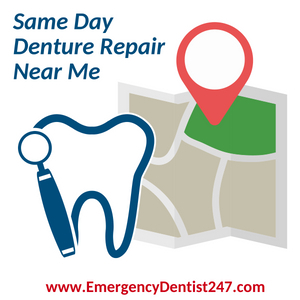 If you’re on Google frantically searching “same day denture repair near me” or even “denture repair lab near me”, you’ve found the answers you’re looking for! Nothing can prepare you for an emergency like broken dentures, but we can help you repair them on the same day they’ve been damaged. Our emergency dentists work closely with lab technicians who can have your dentures repaired on the same day they become damaged. Before you know it, your dentures will be as good as they were the day you first got them! Whether the damage is minimal and you can still wear them or they’re too damaged to wear safely, we can help you. If they’re damaged beyond repair, however, we can have a new set made for you just as easily as sending them in for repair. Emergency Dentist 24/7 – We’re Here to Help! For more information on what we do, or to seek immediate help, give us a call today a (855)-352-6790. If you don’t see your question, or an answer to your question, listed below in our FAQ section, get in touch with us and we’ll do our best to help you out! Instead of endlessly searching Google for an emergency dentist near you, give us a call at (855)-352-6790. We’ll take care of the search for you and have an appointment booked and ready to go in your name in as little as 24 hours. If your gut is telling you that you’re experiencing a dental emergency, it’s telling you the truth! Dental emergencies are scary, but you don’t have to go through them alone. We will help you through it the entire way. If you are unsure as to whether or not you are facing a dental emergency, stand back and look at what’s happening. Do you believe you have an oral infection, has a permanent tooth come out, or has some form of trauma occurred to your mouth? If you’ve experienced any of these, you’re definitely going to need an emergency dentist as soon as possible. How do I find a dentist who speaks Spanish? If you’re struggling to find a dentist who speaks Spanish, let us know! We have a wide variety of emergency dentists who speak both English and Spanish to ensure that patients can receive help no matter which language they speak. Our dental offices are clean and well organized. We understand the nature of emergency pain. We will get you taken care of quickly. 24/7 means 24 hours a day, 7 days a week — Yes this includes weekends and holidays! There is a dental professional standing by to take your call at all hours. Toothaches never sleep, and neither do we. A life-saver! Thanks so much! We are an Emergency Dental Service that has been relieving toothaches all over the 50 United States for many years. Our extensive network of independently owned dental offices have agreed to see patients on short notice, usually within 24 hours of a telephone call. Most offices are open 6 days a week many offices will see an emergency patient after normal business hours, weekends and holidays. Payment is expected at the time of treatment, no deferred billing arrangements are available. We do not accept State Insurance. New to our office? It’s just like any other visit to the dentist, except it might be 3am! Aside from the convenient hours, a visit to an Emergency Dentist 24/7 office is just any other dentist visit. The practices in our network are “ordinary” dental offices complete with their own staff that have joined the Emergency Dentist 24/7 family to extend their care beyond the regular business day hours. An “Emergency Dentist” can continue on to become your regular dentist or you can return to your dentist of choice once the emergency is taken care of. We are glad to pass along X-rays and other patient information. It’s all about convenience and providing the best possible dental care. Stop suffering and call us right now, we have a dentist in your area to relieve your pain.